The capstone of the St. John’s College academic curriculum is the senior essay. 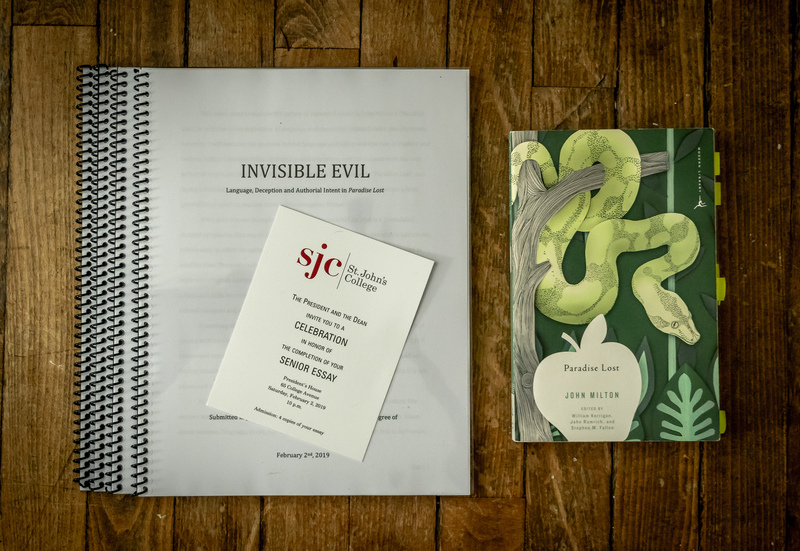 The culmination of four years of reading and conversation, and a month or more of writing, the senior essay is as much an essay on your selected text as it a reflection of your personal journey at SJC. For the past year and a half John Milton and ‘Paradise Lost’ have been rattling around inside my head. It started with a simple question: why does a writer of Milton’s caliber doubt himself? After reading and rereading the poem, page upon page of journaling and reflection, and countless conversations, this is the resultant essay. It explores the power of language, deception and the importance of authorial intent in ‘Paradise Lost’.